Welcome to Farrell Piano. 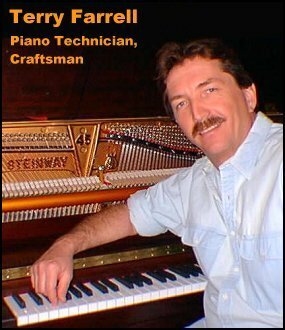 My products and services are available not only to other professional piano rebuilders worldwide, but also to piano owners in the Tampa, Florida area. From routine tuning and service to complete piano remanufacturing and custom piano belly products and services, I strive to maximize the performance of every piano through state-of-the-art technology and expert craftsmanship. Please explore my services, and contact me to discuss your tuning, servicing, and remanufacturing needs. Thank you for visiting my web site. Clean & Clear web page design and photoediting services by Sarah Fox of Graphic Fusion.